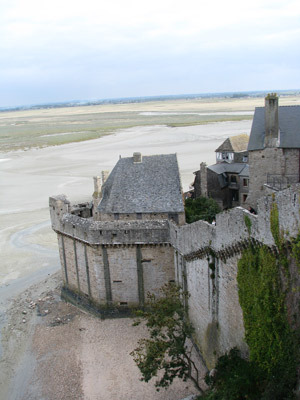 My sister wanted to visit Mont St Michel having visited it once before on a school trip. I'd always wanted to visit but had a niggle that I was going to like it more from a distance than close up. It seemed to me that there was every likelihood that it would have been taken over by tourism. I was right - although it was not as bad as it could have been - probably due to the fact that it's a World Heritage Site. However the combination of souvenir shops and coachloads of tourists made it somewhere I didn't want to be. It gets 3 million visitors a year. I didn't climb to the top to the Romanesque Abbey (which has wonderful pointy bits), as my right ankle was making loud and painful protests at the time. I ducked into the little church on the way up - which offered a little bit of peace and quiet. Then I went up further but headed for one of the look-out areas. At which point I became completely entranced with the sand and the estuary. 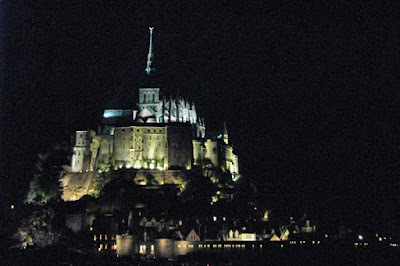 You can see photographs taken from the viewpoints on my Flickr site - Mont St. Michel set on Flickr. I watched a group of people who were right out on the sandbanks of the estuary. I then decided to come back down via the footpath along the peripheral walls - which made the experience a whole lot more satisfactory as this walk for some reason was almost deserted! We visited three times - on Friday afternoon (which was when I stayed longest), Friday evening when we came back to see it lit up - a very spectacular sight from a distance and then again on Saturday morning. On that occasion I stayed down in the car park, got into the back seat, opened the door and got out my sketchbook to sketch. 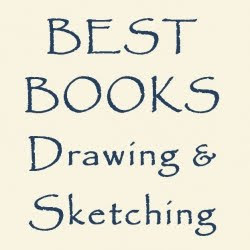 The result is the sketch at the top. 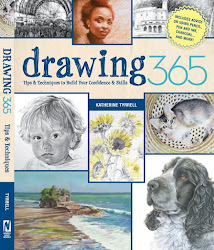 You can see more of my drawings since I got back on my Making A Mark blog post today - From sketchbook to studio - which comments on the thinking and drawing process when I get back home. I've yet to produce a more finished drawing that I'm happy with! You can see a gallery photos of Mont Saint Michel on the UNESCO World Heritage website and yet more on the Monet Saint Michel page on the "Our Place" Collection of Photographs of World Heritage Sites. There are also more links below which tell you more about the site below. Actually staying in a Château on our French holiday was a treat! 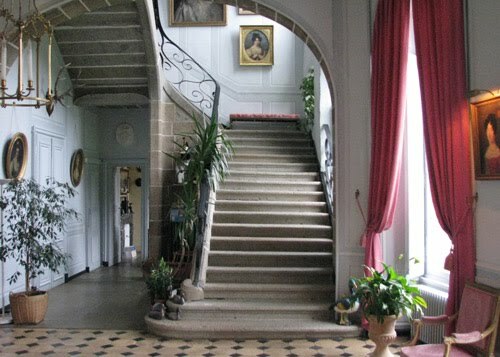 The Châteaux are all so very different and Château de Boucéel, the one we stayed in near Mont St Michel, looked like a very grand house. You can see some photos of it below and there are more online on Flickr. 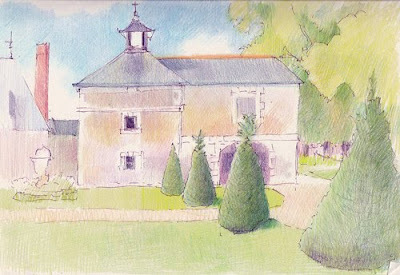 The Boucéel estate dates back to the beginning of the 12th century. It was awarded by Richard III duke of Normandy to the Pigace family. The present château is a Listed Building built in 1763. It is the third one on the estate. 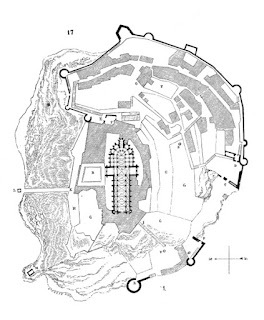 The second was a large square castle with four towers, typical of the Knight Templars, and a stopping place for the Mont Saint Michel pilgrims in the Middle Ages. 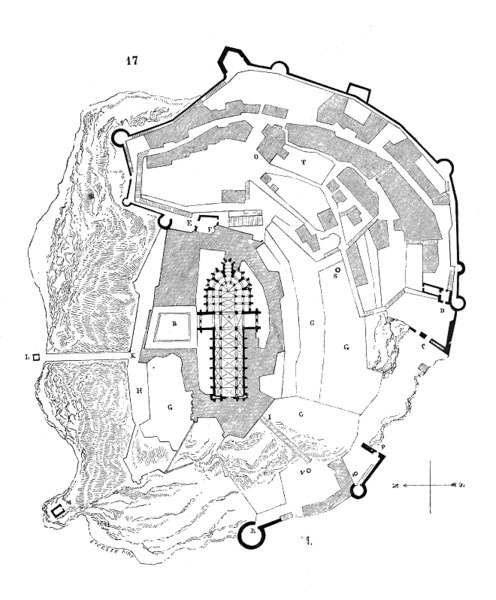 This one is a large “ Malouinière” ( typical Saint Malo architecture at the time of King Louis XIV) with a curve forwarded front on on the North side, with primes on the South side and two lower wings on each side that give it a wide spread. 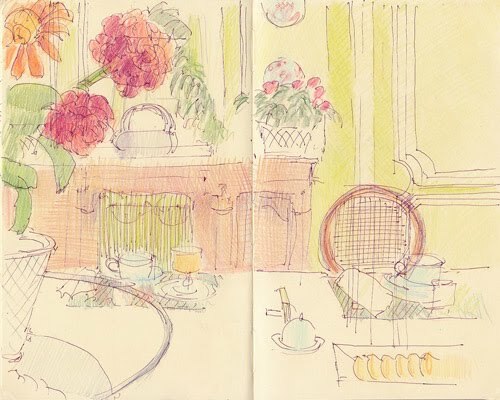 My sketch (at the top of the post) is of breakfast on the Saturday morning and the breakfast table (linen, silver etc!) in their very grand and very lovely dining room which was panelled in wood painted a very pale pistachio colour. A curious colour but it worked really well. It was fascinating to learn from the Comte Régis de Roquefeuil that his father had always drawn his life - in comic book style - and that this was now recorded in a book. He showed me his father's record of his honeymoon in Venice. Arnaud de Roquefeuil, my father, has told his life in comics between 1923 and 1955. 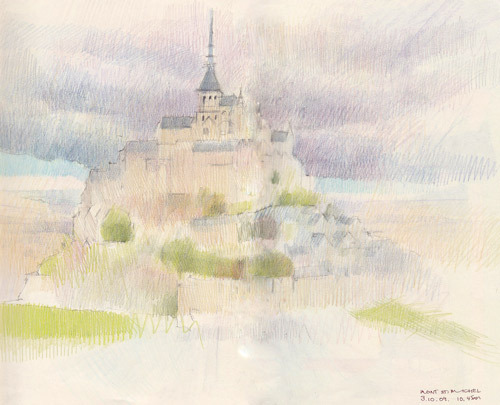 The drawings that you can visualize here come from his album which is in Boucéel. 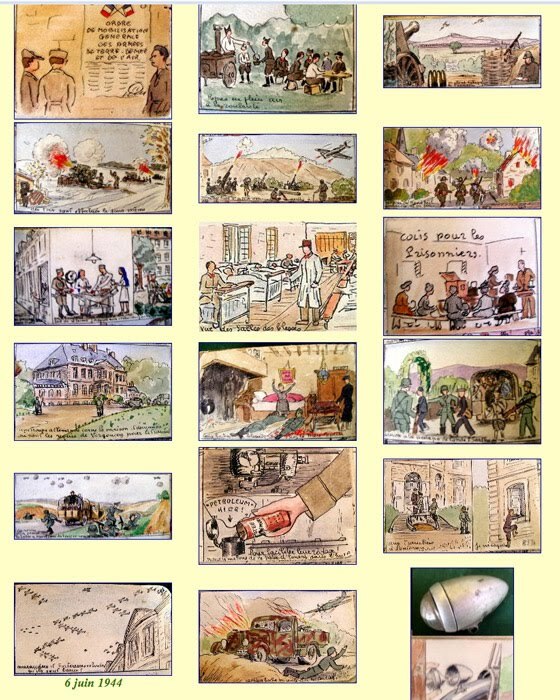 On this page, the website displays the cartoons his father drew during the war about his experiences between 1939 and 1945. 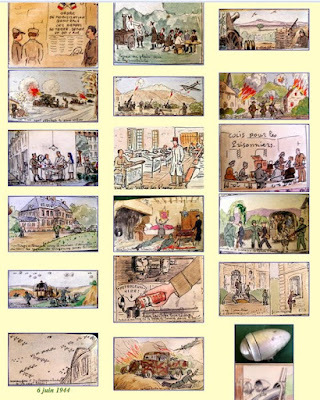 These are published in a book called Chronique illustrée de la Manche en guerre by Arnaud de Roquefeuil. They are absolutely fascinating as contemporaneous accounts of what the war actually looked like in that part of the world. It includes one of planes in the skies overhead on D day. 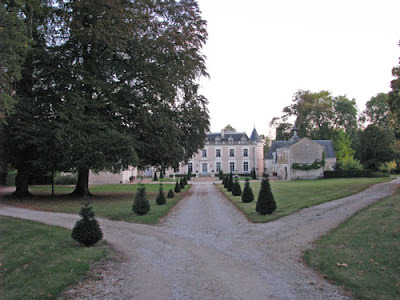 I can highly recommend Château de Boucéel if you ever want to stay in the area. We were made very welcome and I had a wonderful night's sleep in a very comfortable bed followed by and a splendid Petit déjeuner. We stayed in La chambre de Charlotte which is one of the bedrooms which has three beds. I was in a separate bedroom on the other side of the bathroom - which you can se on the link. My sister and I speculated about whether we were going to go home and start creating padded walls. We'd discovered that the walls upstairs were all covered in fabric which when touched had a firm padding underneath. I just kept wondering how they were kept clean! From here we went back to Mont St Michel and managed to get there before the hordes arrived - so the next post on this blog is all about our visit to Mont St Michel! On Day 6 of our French trip, we drove from Rouen down to the coast near the border of Normandy and Brittany coast to see Mont St Michel. Given that we were going very near the beaches where the Normandy landings took place we decided to round out the education of my niece by stopping to pay our respects at one of the many second world war graveyards in the area. This one was east of Caen. Normandy contains a large number of battlefields associated with the D Day Landings and the invasion of Normandy during second world war. Consequently, there are also a large number of war cemeteries in Normandy for troops from a diverse set of countries. Those who died tend to be buried in cemeteries for the Allied Forces or for the German Troops. The cemetaries are largely associated with the D-Day landings in June 1944. We stopped for a while at Banneville-Le-Campagne War Cemetary (location on Google Maps). It contains 2,172 graves many of which relate to Operation Goodwood which has been described as the biggest tank battle the British army has ever fought. The cemetery contains burials from soldiers killed in the Normandy fighting, largely during the second week of July to mid August 1944. At this time Caen was finally captured, there was heavy fighting in the Bocage, and the Falaise Gap was closed as the Germans withdrew from Normandy. Casualties from Operation Goodwood particularly dominate this cemetery. 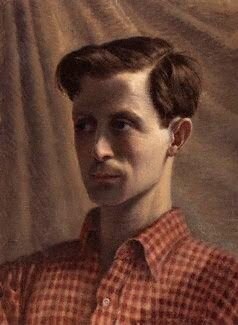 Painter, illustrator, theatrical designer and muralist, a master of pastiche and trompe-l’oeil. Whistler’s elegant baroque designs and witty murals enlivened many interiors including the Tate Gallery Refreshment Room (1926–7) and Plas Newydd, Isle of Anglesey (1936–8). He was killed while on active service during the Second World War. 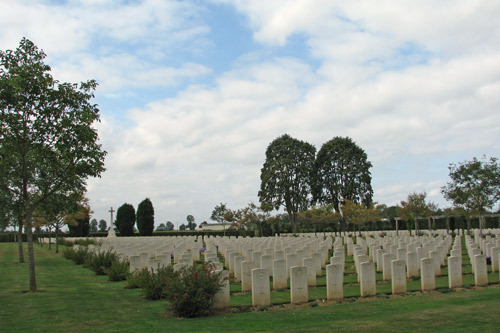 While reviewing the data relating to these graves I found out that you can search for the details of soldiers who survived and those who died - via this website A Short Guide to researching British Army Soldiers in WW2. We reached Mont St Michel in the late afternoon. I'm going to save my comments about it until the post for the 3rd October in which I'll include my sketch. 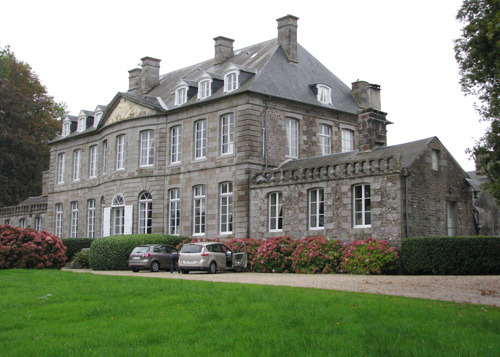 We were staying overnight at the Château de Boucéel and arrived there in the late afternoon after our initial visit to Mont St Michel to be greeted by the Comte Régis de Roquefeuil - Cahuzac! We were made to feel very welcome and and the Comtesse very kindly gave me map of how to find our restaurant for the evening. 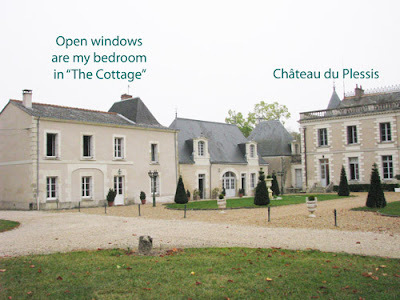 More about the chateau in the next post! 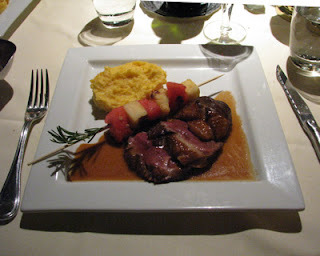 In the evening, we had what was undoubtedly the best restaurant meal of our whole trip. I'd booked a table at the Auberge du Terroir which was, according to Dorling Kindersley, #3 on the list of the 10 best places to eat in Normandy. I'd certainly agree with that decsription. My only sadness is that I forgot to make a note of what we ate in my sketchbook - however I do have a vivid recollection of enjoying an excellent meal. We were also the first to arrive and the last to leave! The sketch at the top was drawn at the start of our meal in between arriving and the first course arriving. 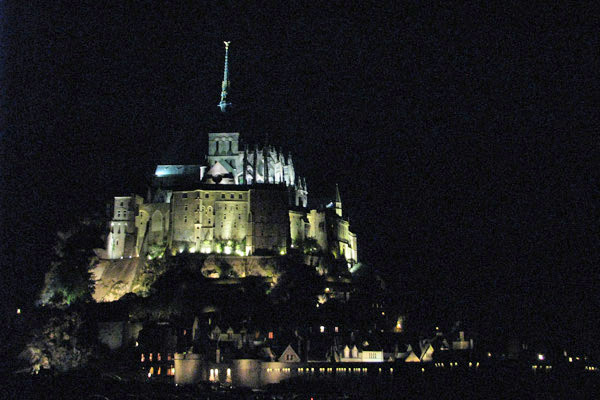 Following the Comte's recommendation, after dinner we made our way back to Mont St Michel to park on the road and see it lit up at night. It was well worth the effort and I have to say it's much more impressive in real life than can ever be captured using a camera! 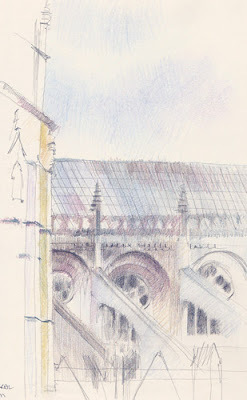 Sketching Rouen Cathedral - from my hotel bed! I was ecstatic to find that, as promised, the hotel that I'd booked (Hotel Le Cardinal at 1 Place de la Cathédrale) did indeed look out on the Cathédrale Notre Dame. However it was off to the side rather than looking out at the front. Which was probably a very good thing as the front was completely enveloped in polythene and scaffolding - obviously some restoration going on! What was even better was that I had a balcony which overlooked the south aspect of the cathedral. I think I did mention I wanted to draw the cathedral! Check out the video from my hotel bedroom balcony - which, for the record, was on the third floor at the front of the hotel. 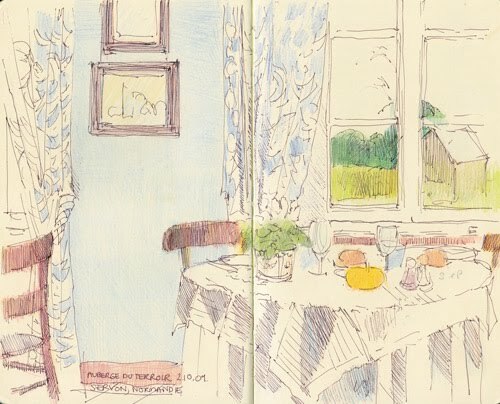 I also started - but didn't finish - a sketch of the interior of the Brasserie Paul where we had dinner. It's the oldest brasserie operating in Rouen and is right next to the hotel - but it had been a very long day! In the centre of the Place du Vieux Marché is the modern church of Saint Joan of Arc. This is a large, modern structure which dominates the square. 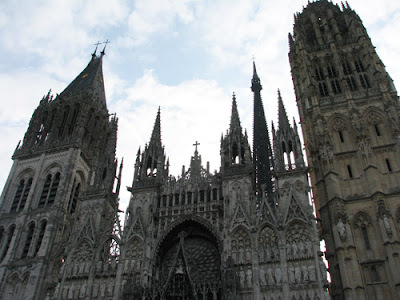 The form of the building represents the pyre on which Joan of Arc was burnt. 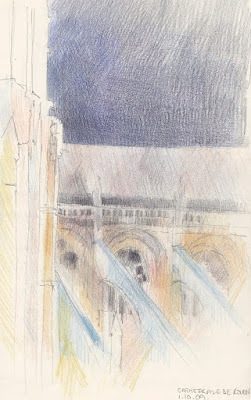 I was saving myself for late night sketching - of the cathedral from my hotel bed! I did two sketches - both of which involved nothing more strenuous than lying on my bed propped up by a pillow! I did one last thing at night and one about 8am the next morning - both of which you can see at the top of the post. It was actually very interesting to see how the form of the cathedral changed in the different light and how different parts were emphasised less or more. A view of the west front painted by Monet - above the scaffolding! At 10am we departed for our journey across Normandy to visit Mont St Michel - via a 2nd World War cemetary asscoiated with the Normandy landings in 1944 - of which more in the next post about our French trip. This week I got into yet another pair of jeans I haven't worn in years. As a result of sketchercise and sensible and healthy eating/drinking, I've now reduced at least two dress sizes. A weight loss of three stone is hovering into sight - I should be there by Christmas with any luck. By way of celebration I went out for lunch at The Pavilion Cafe in Victoria Park - after a long walk of course! 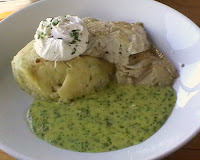 I had 'proper' smoked haddock (none of that disgusting bright yellow stuff!) with a poached egg on champ with bearnaise sauce - yuuuuuuuuuummy (see right)! My diet works on the basis that it's OK to have occasional excesses on the sauce front! 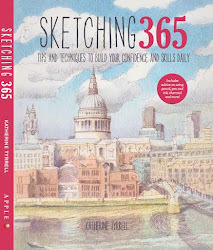 I was thinking this morning that my sketch looks very grey - but then it's a grey day for taking photos of weird sized sketchbooks (which don't scan quickly) and it was greyish day yesterday too! I've now resolved to work out a palette for grey days. 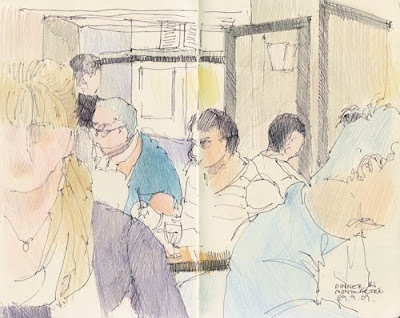 I was sat next to the window in the Cafe eating my meal when I realised that I could probably set up the digi camcorder to film me sketching. I was just about to start when the battery announced it was low - and then switched off! However now I've got the incentive to try again! Here's a short video of the West Lake in Victoria Park and the cafe where I go to sketch. This park and lake are just over 2 miles east of the Bank of England and the City of London - right in the centre of the East End of London! On our way back to the station from Kew Gardens we always pass The Kew Greenhouse which is a small cafe which always looks inviting and seems to be busy. With the earlier winter closing times, we'd missed our afternoon cup of tea in one of the Kew cafes on our last visit. So I managed to persuade Himself that we needed to stop for a cup of tea. 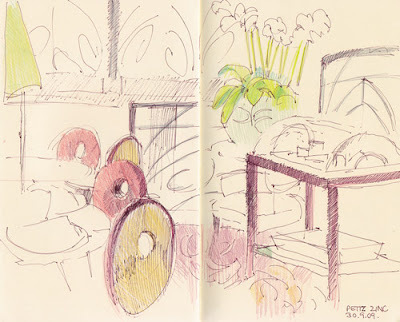 We were squeezed onto the only vacant table - not a great spot unless you sketch! 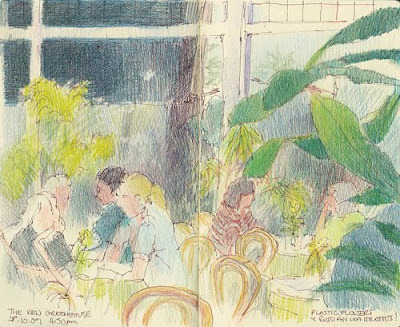 It provided an interesting perspective on all the other people in the main part of the cafe - from behind some huge plant with lollopy leaves. The overall format of the composition reminded me a little bit of Japanese prints. I really must start converting my sketches into 'proper' figurative drawings as I always find them interesting to do. I simply love speculating about the relationships of different people from afar. The really odd thing about The Kew Greenhouse Cafe - which appears quintissentially English (Miss Marple would not be out of place) - is that all the plants are artificial and the waitresses and the girls who serve behind the counter all seem to hail from an Eastern European country - not that long ago judging by the language of choice. 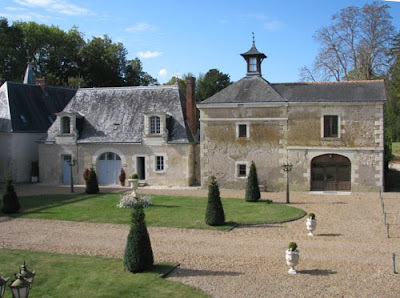 On 1st October we started our grand tour around northern France (Giverny, Rouen and Mont St Michel) before moving down the valleys of the Rivers Loire and Cher to see the chateaux. We picked up our Renault Grand Scenic from the Gare du Nord and set off for Giverny. 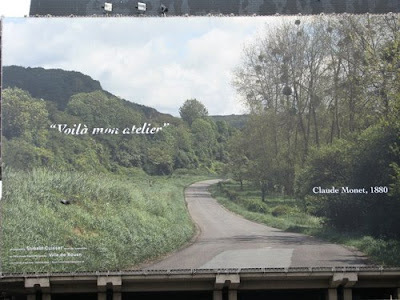 It's not that far from the centre of Paris and is a relatively easy drive - although Google maps will insist on trying to send you to the Foundation Claude Monet in Vernon! I've been to Monet's house and garden at Giverny before and it was much as I remembered it - although a little less colourful being a little later in the season. However, that's all relative given that this is Giverny! We got there just before lunch and left late afternoon - but inevitably it wasn't enough time. I think next time I visit I'll try and make it an all day visit. One of the reasons being that your eyes are assaulted with an awful lot of densely packed visual information. It takes quite a while just to get used the gardens - so you can see what you are seeing. I didn't take enough photos last time I was there - and this time I had my new digicamcorder to play with too. It was actually very interesting looking at the garden through a frame as it helped me to see potential views to work up. The weather changed quite a lot while we were there from cloud to sinshine and back to cloud again! 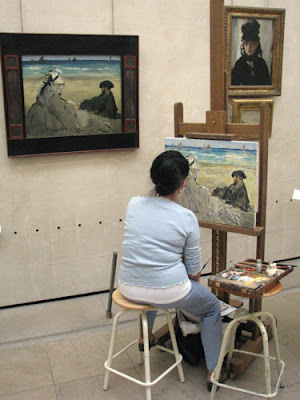 I imagined Monet whipping canvases on and off the easel! One of the things which struck me is how much more the garden had grown since I was last there. then it occurred to me that it probably now looks nothing like the way it did on the water garden side. I checked back to early photos and it's certainly the case that the trees surrounding the pool appear younger and not so dense. A walk around Giverny - #1 The Water Garden (where the nympheas/waterlillies and willows are). This was supposed to be a nonstop walk around the garden however it turned out to be 12 minutes long so I shaved and snipped until I got it to 3 seconds short of 10 minutes - which meant I could upload it to You Tube! A walk around Giverny - #2 The Close Normand (the flower garden). This is a walk from the point where you emrege from the tunnel - up to the verandah on the house - and then from the verandah to looking at the Grande Allee - and the nasturtium - from both ends. 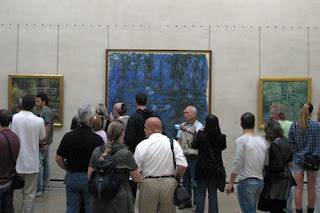 This would have been the route that Monet took to his water garden. 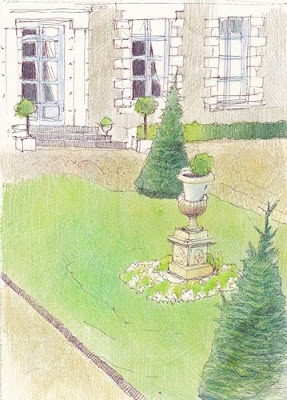 I sat down for a while in the Water Garden - on the only seat in the two gardens - and did the sketch you can see at the top. It's one of those "every green goes with every other green" sketches! It hasn't got the depth of value that's needed as there wasn't enough time - but I'm working on that in a new drawing. Unless planning to stay all day, I'd suggest you go early or stay late or be there over lunchtime to enjoy the garden when it's quieter. Out of high season, I've had success in parking in the car park right opposite the house when I've done this. The tourist groups off the coaches tend to be either side of the lunchtime. Ear plugs are probably a good investment for those wanting to enjoy Giverny in tranquillity. The road which separates the two gardens is not that busy but it can be very noisy - especially in the water garden. Ear plugs also protect you against the completely inane comments of some tour guides who appear really eager to discuss Monet's deomestic arrangements and who slept where rather than the paintings he produced while living here! It's very easy to lose track of time - and the gift shop at the end has some really good out of print books about Monet which are well nigh impossible and/or very expensive to get hold of elsewhere. 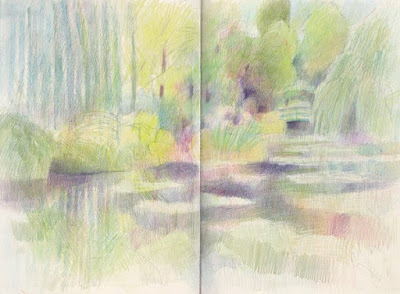 I came away with The Color of Time which is a prizewinning book about Monet and his work. it's worth checking out images of the garden on different websites to see what time of year you'd most like to visit. They all have their pros and cons. I'm glad we were able to pay a visit to Kew Gardens before all the leaves began to fall from the trees. 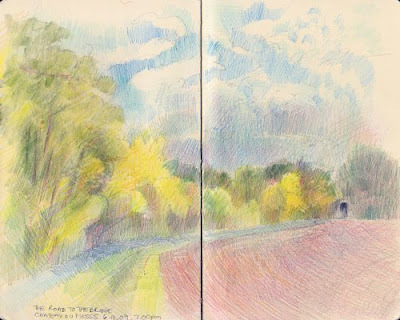 The colours were glorious in parts of the gardens and the trees next to the Sackler Crossing were particularly vivid. The Sackler Crossing pver the lake nearest the Thames is well worth seeking out if you are able to visit Kew Gardens. It's quite beautiful and sculptural. This pdf file tells you moe about it. 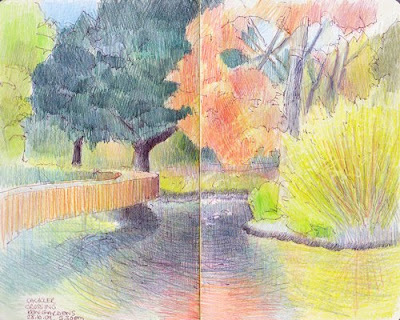 This is a video of our walk in Kew Gardens - Autumn afternoon in Kew Gardens which shows quite clearly at the end the light issues you have to deal with when sketching in late afternoon light in Autumn! If you're curious about the noises on the video there's an explanation half way through. 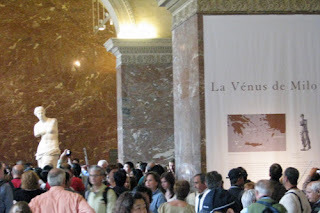 On the Wednesday, after my A day in the Musee d'Orsay, I spent a day at the Louvre Museum. I find the Louvre to be a complete maze and I always get lost in it. It's difficult to get to grips with just how big the Louvre really is, how difficult it can be to navigate or how utterly frustrating this can be on occasion! This time we came in via Passage Richelieu. We started with the Italians in the Denon wing and worked our way across to the Dutch and Northern Europeans in the Richelieu wing. 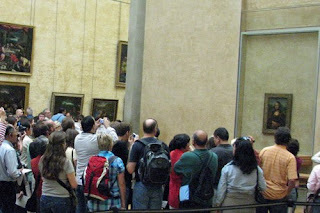 My niece naturally wanted to see some of the very famous works eg Mona Lisa and the Venus de Milo. You would not believe the crowds - so I photographed them! After which I stayed longer and did a tour of the Richelieu wing as that was the part I'd not seen a lot of on previous visits. I began to appreciate far more than I ever done before just why the late ninteenth century saw a revolt against the history paintings which had been regarded as "the best painting that there could ever be". I focused on the still life paintings and built up a collection of photographs which you'll be able to see on Flickr when I get them sorted! 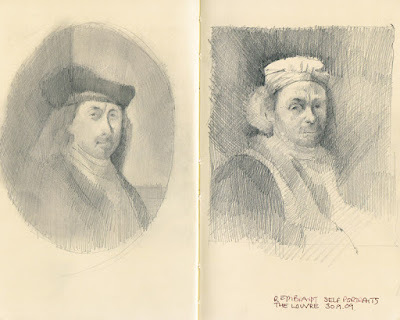 One of my habits is to copy Rembrandt self-portraits - working on the principle that if you're going to copy somebody you might as well copy somebody who was rather good at what they did! The challenge is also that I never seem to get his face right - so I just keep trying! 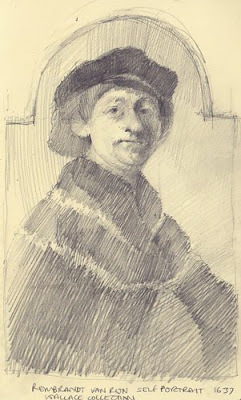 Salle 31 on the 2nd floor of the Richelieu wing of the Louvre has THREE Rembrandt self-portraits hung next to one another. You can see my sketches of two of them on the right. Frankly I think it's another case of needs to try again! This is a virtual tour of the Rembrandt room on the museum's website. 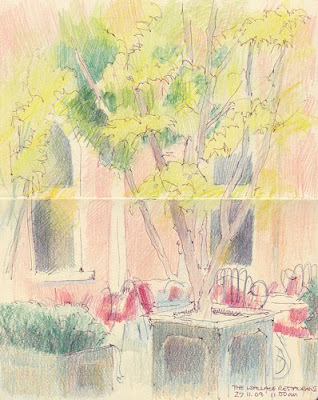 The only thing to recommend the Café Marly is the view from the terrace where I sat to draw the above sketch. It's located at the base of the Richelieu wing and I had lunch there. The food was OK but very expensive and it had really terrible service. I'd still be sitting there if I hadn't commandeered a waiter to bring me a menu, again to take my order, again to take it make sure it was served etc etc. 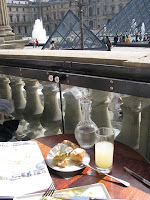 I thought I might have been there on a bad day but I checked with Trip Advisor review of the Café Marly and found lots of comments from people who summed it up as great view, nice but expensive food and quite appalling service. I've got a lot of time for Trip Advisor as I've found them very reliable as a guide in the past and I thought the range of perspectives offered got it about right. I have however very rarely seen a place which has had quite so many people give it the lowest or a low rating. I know I took great delight in finding the right change to leave the precise amount for my meal and no more. Let's just say this was an experience which left me realising just how much places must pay for a good write up in some guides! 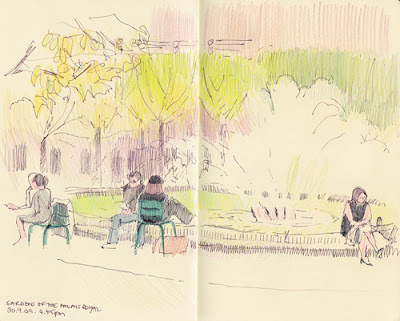 I'd started to get into the way people sit around in Paris gardens. The big trick seems to be to get hold of a really armchair like chair, get it right up to the wall around the pool and fountain and then settle down with a good book or have a snooze. Next to the pool was also a good place for couples to have conversations without being overheard due to the noise of the fountains! 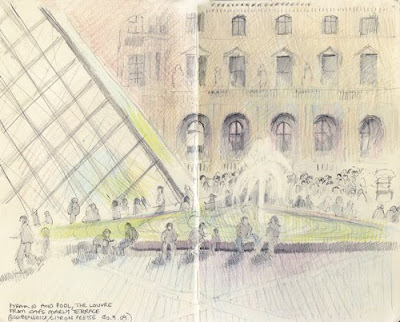 I've only just realised that I've done two sketches of people sitting around fountains - but you do see a lot of that in Paris! The next post about our French trip will be about our visit to Giverny - and will include links to videos of the gardens. I've got to be honest - these aren't my favourite sketches of the whole trip to France. However I though I'd post them on the basis of showing you not all my sketches work out - for various reasons. We visited Montmartre for dinner on Tuesday evening and the first sketch was done while eating dinner in a small but very crowded restaurant. A very cheap meal and, as we were sat very near the serving hatch, it provided my niece with an education about catering size jars and how food gets plated up! However I was very tired from spending all day in the The Musée d'Orsay and I think I was experiencing visual overload. See the following to see the reasons for the visual overload! The second one is of the view from my seat in Le Petit Zinc, a very nice Art Nouveau style restaurant just off the Boulevard St Germain which I ate in once before when visiting Paris and where I remembered the food was very good. The food was still good but for some reason, midweek the restaurant wasn't very busy and what I had planned as an animated sketch with diners off to one side turned into being one of an empty table and a cheese trolley! Montmartre, which is the highest point in the city. I'm currently reading a book (bought in the Musée d'Orsay) about the decade of so before the Impressionists took off and have just got the part about the Paris Commune, how Montmartre was a base for the Communards and played a very impotant part in the in the events of the Paris Commune. In the past Montmartre has also housed the studios of famous artists. 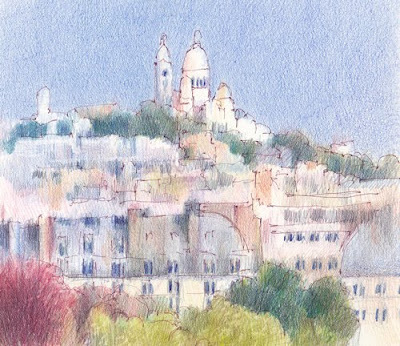 In the mid-1800s artists, such as Johan Jongkind and Camille Pissarro, came to inhabit Montmartre. By the end of the century, Montmartre and its counterpart on the Left Bank, Montparnasse, became the principal artistic centers of Paris. Artist associations such as Les Nabis and the Incoherents were formed and individuals including Vincent van Gogh, Pierre Brissaud, Alfred Jarry, Gen Paul, Jacques Villon, Raymond Duchamp-Villon, Henri Matisse, André Derain, Suzanne Valadon, Pierre-Auguste Renoir, Edgar Degas, Maurice Utrillo, Toulouse-Lautrec, Théophile Steinlen worked in Montmartre and drew some of their inspiration from the area. 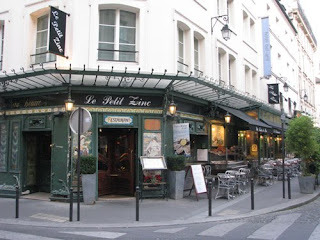 Places in Montmartre - such as the Moulin de la Galette - have also featured in famous paintings and a number of films. The Basilica of the Sacré Cœur was built on Montmartre from 1876 to 1912 by public subscription as a gesture of expiation of the "crimes of the communards", after the Paris Commune events, and to honour the French victims of the 1871 Franco-Prussian War. My dodgy feet don't like lots of steps so I rode the the Funiculaire de Montmartreopened in 1900 and operated by RATP, to the top of the Butte and the Basilica of the Sacré Cœur (Basilica of the Sacred Heart). You don't need to queue at the funicular for a ticket if you have one of the metro tickets from a carnet of 10. However I did manage to do a very careful - and slow - descent. 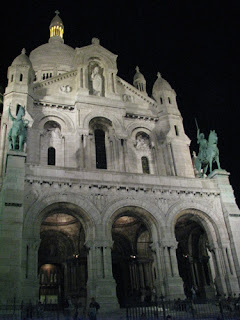 I do recommend visiting Sacré Cœur at night. There are very few tourists - unlike during the day - and it's very quiet and peaceful. Or or rather it would be if there was no music being played loudly outside where there was large crowd of youngsters (swings and roundabouts!). Also if you've seen the magnificent view from the terrace outside before then it's interesting to see it again at night although it's pointless trying to take photographs! This is a link to photos of Montmartre in the 1900s. Le Petit Zinc - and what happens when the diners sit somewhere else! The Boulevard Saint Germain is home to some famous cafés, such as Les Deux Magots and Café de Flore, which used to be home to the philosophical literati. Since the Avenue des Champs-Élysées stopped being the prestigious place it used to be, the money seems to have moved to Saint-Germain. I know I've noticed a big difference on every visit. The exterior of Le Petit Zinc - I had the duck! On our second day in Paris I visited the Musée d'Orsay and the Sennelier shop at Quai Voltaire (on the Left Bank, opposite the Louvre). Click this link to see a Google map of the places I visited - also shown below. You can also copy works in the museum as follows. The museum makes a distinction between freehand drawing (including sketching) and people who want to set up an easel and copy paintings (by sight-size methods presumably). you can only to enter the museum with a handbag. So my sister's very large shoulder bag got in but my sketching backpack had to go in the cloakroom. I'd pared it right down so it wasn't in any way bulky as I've had this problem before but they were still adamant that all backpacks had to go in the cloakroom. (If I'd had a handbag inside the backpack I would have been able to take a basic kit in). 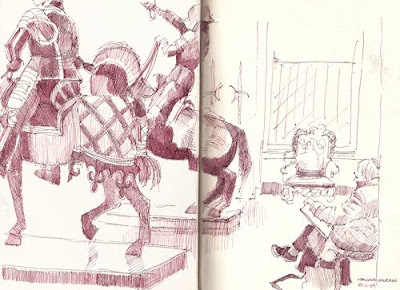 the museum can be incredibly busy in certain areas - which means a lot of potential 'visual interference' while sketching. Plus you need to get yourself set up somewhere where you aren't in the way of other people as otherwise you'll be jostled on a fairly frequent basis as people tend to look at the pictures rather than where they are going! I have to confess! This sketch the top of this post is a total cheat by me! 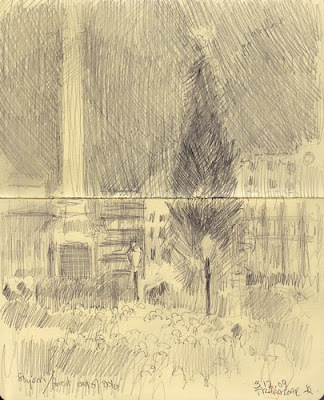 It's the sketch I would have done from the roof terrace of the Musée d'Orsay - if I'd just had my backpack with me! Instead it was done back in London from a photo I took from the terrace. The terrace is reached a door at the side of the cafe at the top of the building. The door to the terrace seems to be locked after summer is over. I've visited on a fine day at the end of October and was unable to get out on the terrace. However it was a fine warm day at the end of September when I visited. The door was unlocked while I sat eating lunch in the cafe and hordes of people immediately poured out and on to the terrace! 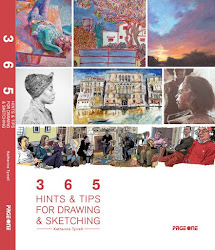 Art shop review: Magasin Sennelier, Paris provides my perspective on the Sennelier shop I visited after leavingthe museum. I've also got a Flickr set of photos taken in the Sennelier shop.